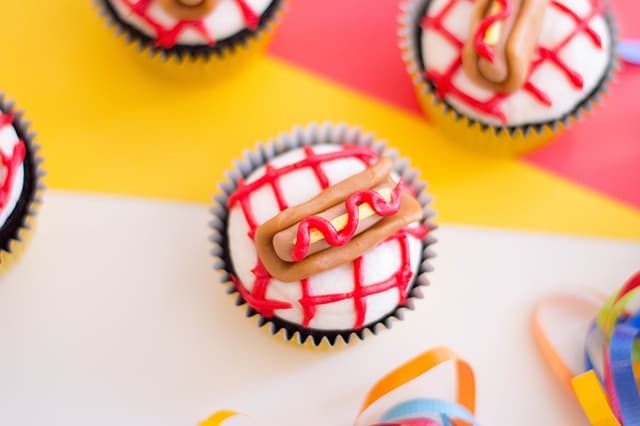 Tomorrow is National Hot Dog Day and I’m celebrating with these hot dog cupcakes! 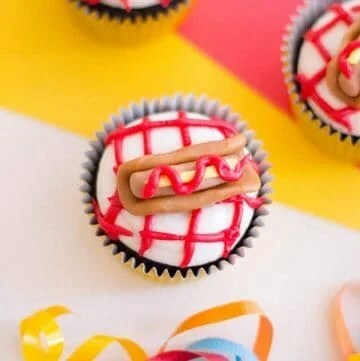 Whip up this moist chocolate cupcake recipe, add the perfect mound of frosting, and top with a little caramel wrapped fondant hot dog garnished with frosting ketchup and mustard! They make great cupcakes to take to a cookout too! I bet you were thinking that I was giving you a recipe for cupcakes stuffed full of hot dogs, didn’t you? I wouldn’t do that to you. 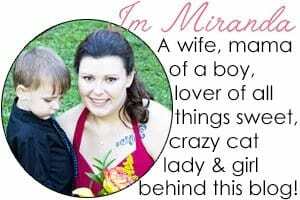 Besides, that’s gross. No one would ever click on that recipe unless they were there to troll. The mini hot dogs on top are so cute. Most of the cupcake decoration is made of squares of caramel instead of fondant which is nice. I think it’s a nice surprise when you bite into it and figure out it’s not all fondant. I did see some hot dog corn muffins on Pinterest the other day. They looked really scrumptious. I love a sweet corn muffin. On a rare occasion, I make my son corn dogs and my mouth just waters smelling the sweet corn dog that wraps the hot dogs. I’ve never actually taken the time to work on my own “perfect” cornbread though. I’m putting that on my list of things to work on. My husband gets weak at the knees for cornbread. I don’t normally buy colored fondant. I did happen to have brown which is rare. I bought it for a project I was doing for a birthday cake. I normally just get white and add gel paste color to it. Warm the white fondant between your hands by working it until it softens. Add a couple drops of brown gel food color to the fondant. Don’t add too much because it will make the fondant super soft and sticky making it extra hard to work with. Put on gloves if you don’t want your hands to stain. I never bother with this. Work the gel food color into the fondant until it’s a solid color. If there are streaks, continue working it. If the fondant gets too sticky, I add a little cornstarch to the fondant. The cornstarch will lighten the color a little. Once you have your brown fondant, keep it covered with plastic wrap until you’re ready to use it otherwise it will dry out. For the hot dog, line a baking sheet with wax paper and start rolling out your fondant into small ¼ inch balls. Roll the balls into tiny logs with rounded ends. For the bun, knead each caramel and flatten it out to be about 1 inch in diameter. Place your fondant hot dog in the center of your flattened caramel and wrap. Decorate with red and yellow frosting (as ketchup and mustard) and place on top of each frosted cupcake. I really like the addition of the red squares that I added on top of the frosting/underneath the fondant hot dogs. It makes me think of that checkered containers that you get your hot dog in. Plus it’s a great way to use up that tube of red frosting. How did you get your red frosting so bright? I used Wilton’s Red Icing instead of making my own and trying to get a bright red color. If you make your own, I would recommend that you let the frosting sit overnight to deepen the color. That always helps me. Do I need to use fondant to make the hot dog? I recommend it, but you could probably color some stiff frosting brownish red and pipe a little line in the caramel with a small..ish straight tip to look like a hot dog. To make stiff frosting, I would add extra powdered sugar to the frosting. Where can I find the caramel squares? In the candy section of your local grocery store, Walmart, Target, and basically everywhere when Fall candy makes an appearance in the stores. They’ll be individually wrapped in the bag. 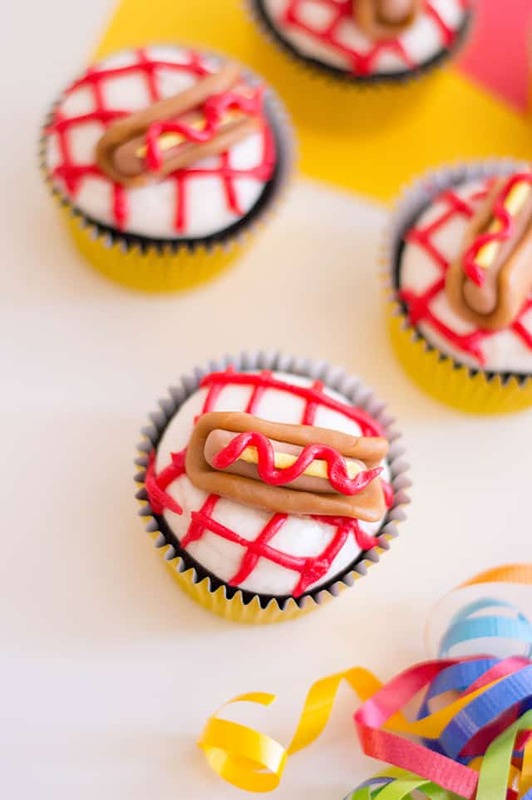 Celebrate National Hot Dog Day with these hot dog cupcakes! 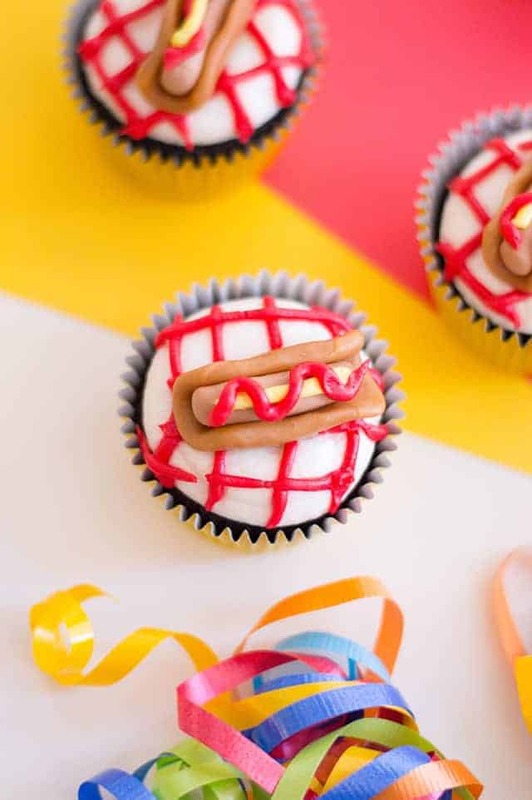 Whip up this moist chocolate cupcake recipe, add the perfect mound of frosting, and top with a little caramel wrapped fondant hot dog garnished with frosting ketchup and mustard! Preheat oven to 350 degrees. Line cupcake tin with yellow foiled cupcake liners. In a large mixing bowl, add butter and sugar. Beat on medium with hand mixer until combined. It will look like wet sand. Add in the oil and beat until combined. Add in the eggs one at a time and beat until each egg is well incorporated before adding the next. Scrape down the sides of the bowl. Microwave the chocolate in 20-second intervals for 4-5 times until it's completely melted. Stir after each interval to prevent the chocolate from burning. Let it cool for two minutes. Add the chocolate into the mixing bowl and beat to combine. In a small separate bowl, add the warm water, coffee granules, and vanilla. Stir to combine. In a large separate bowl, sift together the flour, baking soda, baking powder, and cocoa powder. Alternately add the flour and water to the mixing bowl starting with the flour and ending with the flour. Beat just until combined. Scoop batter into the prepared cupcake tin. Fill the liners two-thirds full. Place in the oven and bake for 16-18 minutes or until done. Place a tooth pick in the center of the cupcake and if it comes out clean they are done. In a large mixing bowl, add in powdered sugar, butter, milk and vanilla extract. Beat on low/medium until most of the powdered sugar is incorporated. Increase hand mixer to high and beat for another 30 seconds to 1 minute until semi-stiff consistency forms. Add the frosting into a piping bag fitted with a large straight tip. Pipe a large mound of frosting on top of each cupcake. 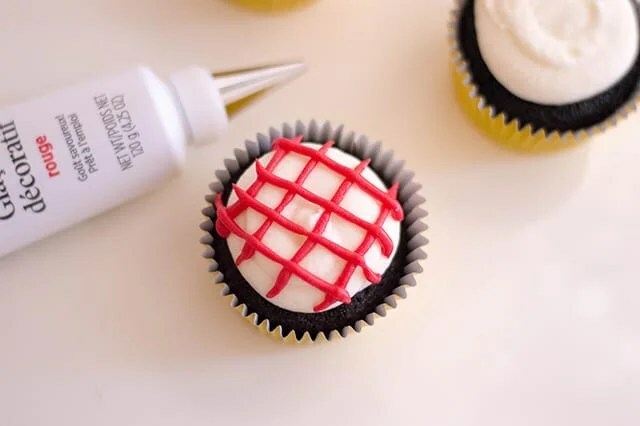 Do this by holding your tip in the center of the cupcake and applying even pressure to build the frosting up while slowing pulling your tip up away from the cupcake. Place a small piping tip on the tube of Wilton red frosting and pipe small lines across the mound of frosting. For the hot dog line a baking sheet with wax paper and roll out your fondant into small ¼ inch balls. Roll them into tiny logs with rounded ends. For the buns, knead each caramel square and flatten each one out to be about 1 inch in diameter. 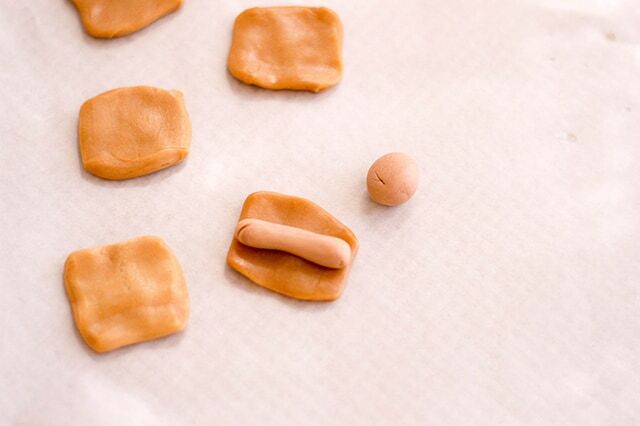 Place your fondant hot dog in the center of your flattened caramel square and wrap to look like a mini hot dog. For the ketchup and mustard, decorate with red frosting and yellow frosting. 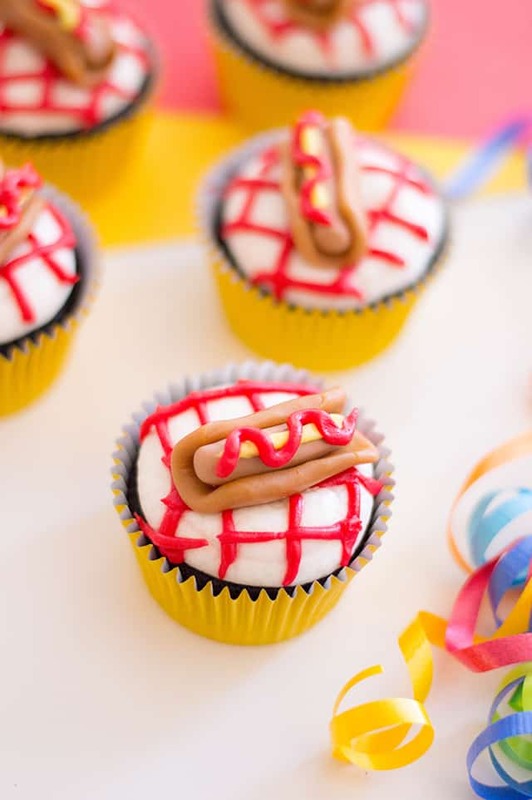 Place the little hot dogs on top of each cupcake.